Last weekend we visited the Enchanted Christmas event at Whitworth Hall in Spennymoor, County Durham. I’ll be honest: when we visited Whitworth Hall a few weeks ago, because we’d had a great time, as we were leaving, I did look up the event but discounted it because it looked too expensive. At £25 for children (£15 for under twos) and £21.50 for adults, I decided it was far too pricey to be worth it. Well, I think – having now been – that I was wrong. I think that’s a great price for the experience. We were lucky enough to have been invited by She’s Gott It! to attend in exchange for this review. 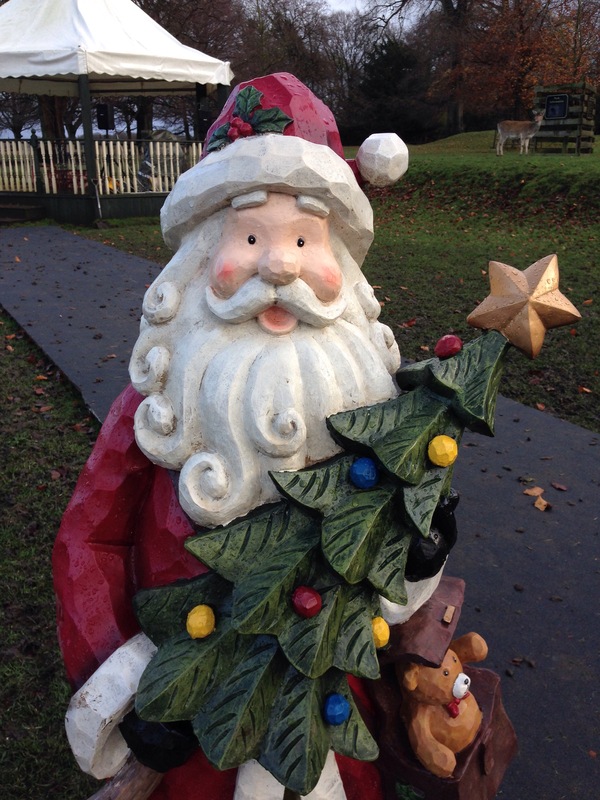 Enchanted Christmas is a half day experience in the country park of Whitworth Hall. Tipis have been set up, and there are a number of Santa’s friends in each tipi, as well as the big man himself in a tipi in the old walled garden. Our session was from 9am to 1pm, though I think if you wanted to you could spend longer because you could keep popping into the café/shop tipi for refreshments and a pit stop to do some crafty activities. Dress according to the weather! First things first, we were fortunately warned in advance to make sure the kids are wrapped up warm and have sensible shoes on. There are heaters in each tipi, but there’s a little walk between activities, and those paths are very muddy. We put tights, trousers and socks on both boys, and also some welly socks for James. They each had three layers of t-shirts and a woolly Christmas jumper under their coats, and neither seemed cold at all. The weather on Sunday was nippy, and we were outside for most of the morning, with some standing around in the field or watching entertainment, so I’d advise you to also wrap up warm. I had Noah in the Ergo, and James wore his wellies. I’d think long and hard about taking a pushchair – the paths were really muddy, and we got splashed with mud. Some of the others in our groups did have pushchairs and they were really full of clarts – maybe if you don’t mind taking a cheap pushchair and have a boot protector ready, you’ll be ok. When we arrived we were a little bit late, so we missed our first activity of feeding the deer. The bag of deer food is included in the price, and it is a lovely experience to have deer eat out of your hand. However, we soon found the Elf leading our group – Snowballs – and we were given our wristbands and then we had time to take some photos while we waited for other group members to arrive and also be signed in. The country park and hotel have been decorated in a way that is just begging for a dusting of snow to make them look really wintery. Our guide Elf took us to the tipi with Fairy Treetopper in. The Fairy Treetopper had the children up and decorating two of the parents from the group as Christmas Trees, with baubles and tinsel. James seemed to be a bit shy and stood with tinsel in his hand for a while before he was encouraged to pop it on to the ‘tree’. Maybe he just didn’t like the idea of a human tree – he does like things to be proper! We sang two songs with Fairy Treetopper, and she went round the tent twice – once to give ornaments for the children sat on benches, and another to give out fairy dust, which was a nice inclusive touch. Our next tipi visit was to Mrs. Claus, who greeted us with hot chocolate and warm double chocolate cookies. She told us all a tale about the time her husband got stuck up a chimney. Then we sang the song together, as well as Jingle Bells. These are two songs James has been learning at preschool the past couple of weeks, so that was really lovely because he knew the words and could confidently join in. After about 30 minutes we heard a rumbling noise and we were told that the train had arrived to take us to see Santa! We arrived at the gate to the old walled garden (such a shame to see this had gone to weeds – it used to be a fantastic little garden) where Santa‘s tipi is set up. In this tent there was a real fire, which, although lovely and warming, actually had a bit of a downside in that the roof of the tipi had to be open. This meant that the beanbags were all wet, which I didn’t find out until I sat down with both the boys. Oops. Santa read from his book information about each child in the room – he knew all the children’s names, what they wanted for Christmas and some interesting information about them. Santa didn’t just read out this information from the email the parents had sent in advance – he asked questions around it and took some time to talk about it and most of the children looked enchanted. The group was large but it didn’t feel too much to listen to this from Santa. Afterwards the children lined up for a gift and a photo with the big man himself. Saying goodbye to Santa, we jumped back on the land train again, although we could have walked down to the main group of tipis. After we left Santa we also visited Jack Frost, who had us all up dancing after reading us a story about how he nearly stole Christmas. I’ll be honest, I didn’t hear the story, my head was too busy with how my bum was getting damp sitting on logs outside. I know James really enjoyed the dancing because he’s re-enacted some of it today. Tips for surviving Christmas with little kids! Later, in the café/shop tipi we made some snow globes which are really effective Christmassy ornaments, and might last a few years – we’ll have to see how they fair. There were other craft activities, too, as well as hot and cold food and drinks. The little shop is reasonably priced and there were some lovely pieces. Our final tipi visit was to Chief Pooperscooper, who taught us a rude version of Jingle Bells that magically turns reindeer poop into food. Some of our group had left by this point, the cold being too much, but those children who were left remained enthusastic and shouted to Chief Pooperscooper at the appropriate points. The Elves and other characters’ costumes and tipi sets were really good – no jumpers from Primark kind of cheapness about it. The mud was an issue. Other people in our party had pushchairs that got covered, and also dirty bottoms from sitting on the seats provided. There were beanbags in each of the tipis that would’ve been ideal for the children to sit on together, but because mud was being tracked through from the field, the kids were getting muddy just from sitting down. We couldn’t put Noah down at all because he’d have been crawling in mud. It was a magical time for children in around about the 3-6 or 7 year old age range. James is just 3, and beginning to form an idea of what Christmas is in his head, so this was a really good introduction to some key players in the Santa-side of Christmas. Santa was brilliant, and the idea of emailing ahead information about the kids was inspired – top marks to whoever thought of that gem. The gift is very good, also, with different presents for James and Noah, so it makes each feel special. All the bits tie into the stories we heard during our day, and can be used on Christmas Eve to prepare for Santa’s visit. 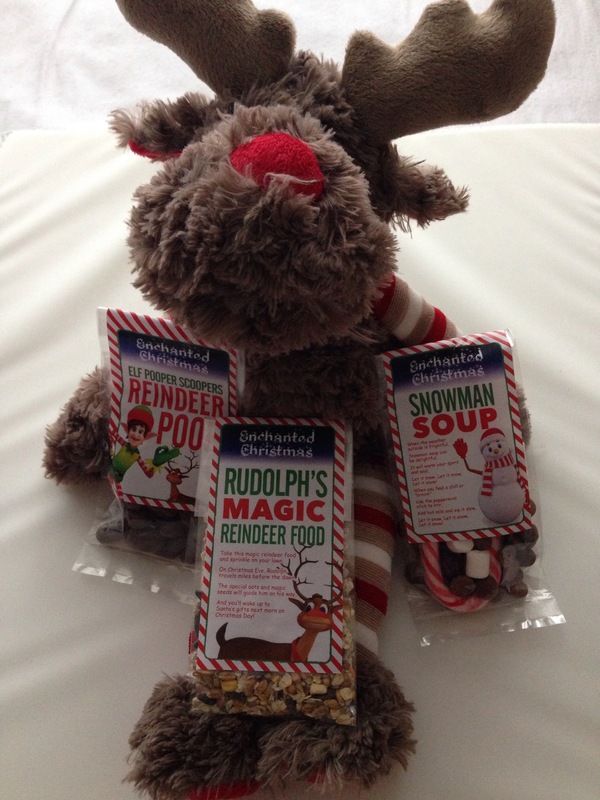 You can win a Christmas Eve kit (not the same as pictured) below. I’d recommend this Enchanted Christmas event at Whitworth Hall if you’re looking to kickstart your Christmas season. It was pretty special! The following giveaway has ended. Thank you to all who entered. Going abroad this year for Christmas? Here are some tips for making it special. What a magical day – I think when there’s so much magic it is worth every penny as they are only little for so long aren’t they. Absolutely – you’re so right! Hearing all about Jack Frost and his dance all week obviously means my son enjoyed himself! What a fab experience for James and Noah, it’s great that you got the opportunity to experience it and you really feel like it was worth the price. James looks like he was really into all the different activities and it’s fab that he knew the words to some of the songs to join in confidently. It’s great that you were prepared for the mud and the cold with layers and wellies although it was a shame Noah couldn’t go down for the mud. Thanks for linking up with me on Country Kids. Yes, it was a great day out and I’m so pleased that we got to go! James has been singing and dancing like Jack Frost all week, so it certainly made an impression! That is exactly what we need. A good freeze! Sounds like a fabulous festive experience! I love the look of the decor and actors. Shame about the mud! This sounds good and not too far from us, but the mud would be an issue I think, having a toddler who likes to throw herself on the floor or demand to be carried the minute she’s tired! Oh and is it me, or does Jack Frost have a look of Rod Stewart about him! haha! Jack Frost fancied himself as a bit of an actor… He found it difficult to keep to one accent, for example! He was funny 🙂 I do see what you mean about Rod Stewart!